Stingray Divers is more than just a dive shop. 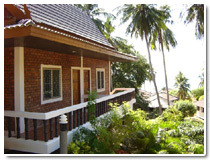 Overlooking the bay in Mae Haad Beach, we have resort facilities at Crystal Resort. Our modern rooms and bungalows offer a powerful fan, en-suite shower & toilet, 24hr electric and are available as singles, twins, doubles or a large space for the entire family. 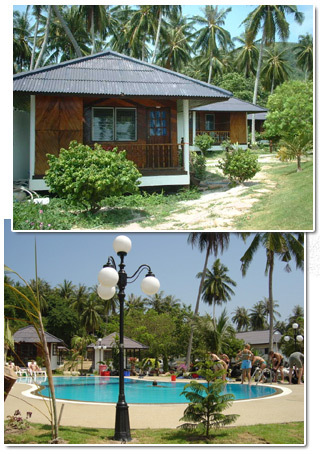 When diving with us all PADI students qualify for a special discount of only 200Th.Baht per night for the duration of the course. 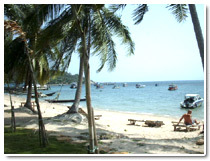 Fun divers only pay 300Th.Baht, provided you are diving with us at least every other day! Our beachfront restaurant is a popular spot on the island. Our team of local chefs can serve up all your favourites from home, burgers, salads, sandwiches etc. as well as some of the best known Thai specialities. The resort organizes regular social events, such as magic shows, card games and other fun activities. It does not matter if you never played, we teach the games too. We have twice a year a special package for singles for wish to meet a new companion under the tropics. The resort has a playing room where you can play pool games, foosball, video games and you can connect to the Internet.